I checked in to 5 places, took 1 photo, and walked 8.3 miles. I was in Des Moines. Sunday fun day. 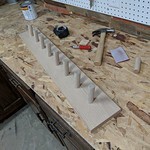 Building a small coat rack for guests.